Tuesday, 8 January 2019, 10:21a.m. Leka Pasiaka is believed to have drowned off Whatipu Beach in West Auckland. A body believed to be that of missing teenager Leka Pasiaka, who was swept away at Whatipu Beach, has been found. Police said this morning the body was recovered north of Piha Beach after it was spotted by the Eagle police helicopter last night. Teen Leka Pasiaka, 16, was swept out to sea about 1.30pm on December 29. "At this stage, police believe it to be the 16-year-old swimming reported missing from Whatipu Beach on December 29, 2018,'' Inspector Gerry Whitley said. 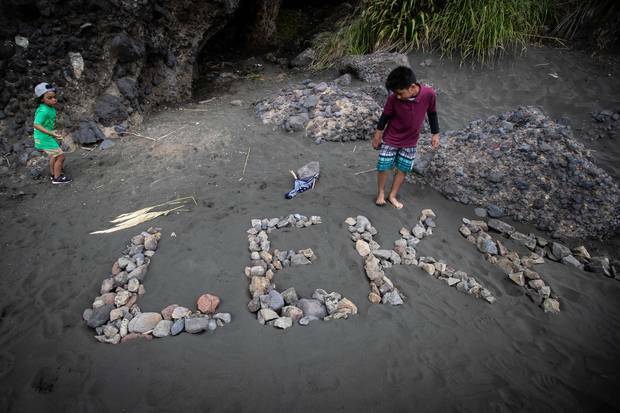 Saulala Jr Fononga, left, and Litani Jr Katoa write a tribute to their cousin Leka Pasiaka at the beach. The Avondale College student has been praised for his bravery after pushing his sister back towards safety when she swam out to try to save him. Leka's sister was taken to hospital. When she was discharged, she returned to the beach immediately; vowing she would not leave until her brother was found. Family members = including those who had travelled from Australia after hearing about the tragedy - have been keeping vigil at the beach since the young man went missing.